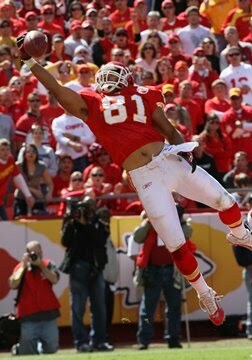 KCMB Kansas City News: Chiefs Trounce 49ers, Move to 3-0! Chiefs Trounce 49ers, Move to 3-0! Chiefs fans rejoice! It hasn't felt like this for so long. Wins number one and two for the Chiefs left us wondering if the Chiefs are contenders or pretenders, but Sunday's dismantling of an improved 49er team leaves no doubt, this team is for real. The Final was 31-10, but the game wasn't even that close. San Francisco scored their lone touchdown as time expired on a field full of second defensive players - and got Wide Receiver Josh Morgan hurt in the process. Creative play calling by Todd Haley and Charlie Weis even made Matt Cassel look like an NFL quarterback! Of course when you run the ball for over 200 yards as the Chiefs did Sunday, it takes some pressure off the passing game. Holding your opponent to 40 yards rushing doesn't hurt either. Cassel seems more comfortable with his playmakers. Tight End Tony Moeoki looked like he can fill the massive cleats of the departed Tony Gonzalez. He made a spectacular one handed catch in the back of the endzone in the 3rd quarter that really put the game out of reach. Throw in great offensive line play and a running attack that the 49ers defense had no answer for, and the rout was on. Todd Haley kept the niners off balance all day with some trickeration. A beautifully executed onsides kick was nullified by an offsides, but what a great call. The 49ers were stunned. When the punt team ran off and the offense ran back in on a pivotal 4th down, I think a couple of 49ers actually wet themselves. It was a coaching gem. Speaking of coaching, how about the job Romeo Crennel is doing with our defense. Five sacks, an interception, 40 yards rushing, and San Francisco Offensive Coordinator Jimmy Raye was fired this morning. (Seriously, how does that guy keep getting hired in the NFL). I only hope another team doesn't want to try Crennel as their head coach next year. The Chiefs are off next week before tough, tough road games in Indianapolis and Houston. If they can win one of these games, I think they are playoff bound. Waiting two weeks to watch this team play again is tough. I can't wait, and I'm sure the players feel the same way. Awesome game! Arrowhead feels like Arrowhead again. It is so great to be a part of the game, or should I say the 12th man, because the stadium is so alive and vibrant as it was back in the Vermeil days. The fans are really into it and everyone in Kansas City BELIEVES now. I predict that Indy is a close game and that we take Houston down finally.